At the same time, the researchers suggest that weight-conscious consumers might want to use olive oil only in moderation, given that it is high in calories. Coconut and palm oils, by contrast, come in for special concern. The analysis says the purported heart-health benefits of such oils are unsubstantiated and recommends that consumers avoid using them. 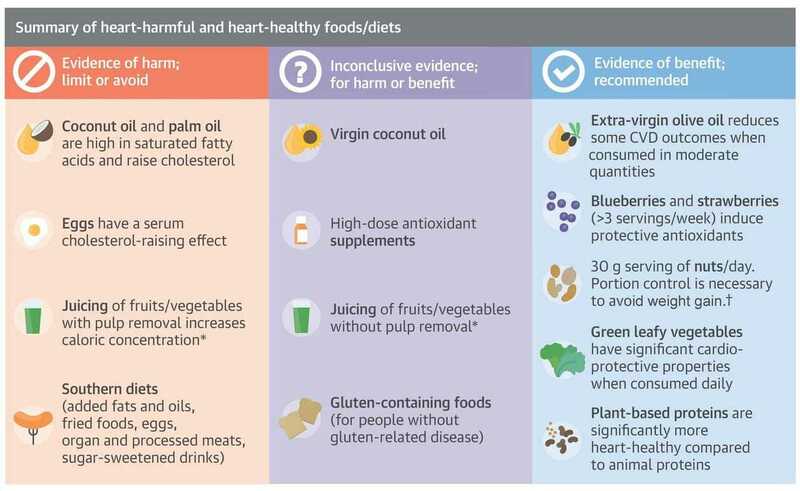 The scientists note that a number of health fads such as juicing, gluten-free food and herbal medications have not been shown to offer cardiovascular benefits. “A generous amount of veggies and fruits, a moderate amount of whole grains and nuts, supplemented with your favorite protein sources of legumes, fish, poultry and lean meats, is a heart-smart, healthy eating plan,” Michael Miller, a professor at the University of Maryland School of Medicine, and a co-author of the review, said in an interview with the Washington Post. The 52,000-member American College of Cardiology says that The Journal of the American College of Cardiology is the most widely read cardiovascular journal in the world.